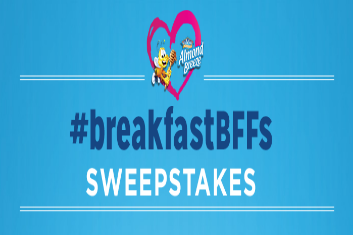 Almond Breeze & Honey Nut Cheerios BreakfastBFFs Sweepstakes – Win a trip for 4 to California! Win a trip for 4 to Los Angeles, California! ENTER SWEEPSTAKES HERE – Almond Breeze Sweepstakes page. ENTRY LIMIT – Limit one entry per person during the sweepstakes entry period. ELIGIBILITY – Open to legal residents of the 50 United States and D.C., age 21 or older. SWEEPSTAKES ENTRY PERIOD – Sweepstakes begins at 12:00:01 AM ET on 02/01/18 and ends at 11:59:59 PM ET on 03/31/18. – Round-trip, coach air transportation for Grand Prize Winner and three (3) guests to Los angeles, California from a major airport nearest the Grand Prize winner’s residence. First Prize: There are two (2) available to be won. Each First is a $500 Visa gift card. The ARV of each first prize: $500.